Peyton Manning hilariously congratulated Drew Brees after losing his NFL passing record to the New Orleans Saints quarterback. Brees became the NFL's all-time passing leader against the Washington Redskins on Monday. The 39-year-old surpassed Manning's record of 71,940 yards on a 62-yard touchdown pass to Tre'Quan Smith late in the second quarter. Monday's game was briefly interrupted so Brees could celebrate with his team-mates, family and Saints head coach Sean Payton. But the funniest, and quite possibly the most fitting celebration, came from Manning himself. In a hilarious video, Manning congratulated Brees – a Super Bowl champion and MVP – while he was preparing dinner for his family. "Drew, for 1,000 days I've held the record for all-time passing yards in the NFL and I've got to tell you, it's been the greatest 1,000 days of my life and thanks to you that’s over now," Manning said jokingly. "You've ruined that for me. So, thank you very much. I have nothing left to look forward to except slicing my tomatoes [and] making dinner for my family." 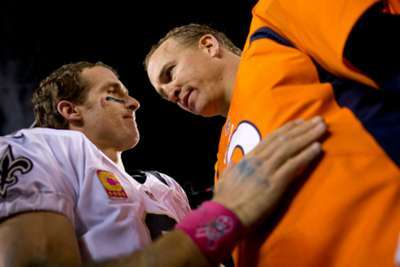 Former Indianapolis Colts and Denver Broncos QB Manning – a two-time Super Bowl winner – then turned serious. "Drew, congratulations on this record," the 42-year-old said. "You've done it the right way. All your hard work and dedication has paid off."